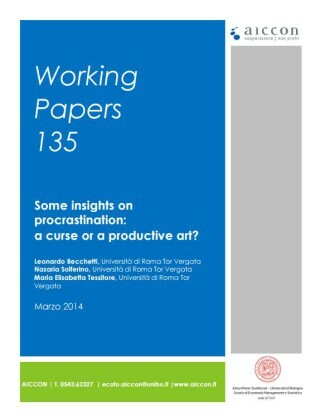 You are here: EMES - International Research Network | Publications | Members' publications | Some insights on procrastination: a curse or a productive art? The choice between performing a task today or procrastinating it until tomorrow or later is the building block of any economic action. In our paper we aim to enrich the theoretical literature on procrastination by outlining conditions for bad and good procrastination and looking at the special cases of pathological procrastination, the curse of perfectionism and productive procrastination. We discuss how our theoretical framework may be applied to explain different types of (education, investment and production) microeconomic decisions and which policy measures can be taken to avoid bad procrastination.